In Simon Said (2x05), Dean wears it for the duration of his time in Guthrie OK (except when he is wearing a suit). 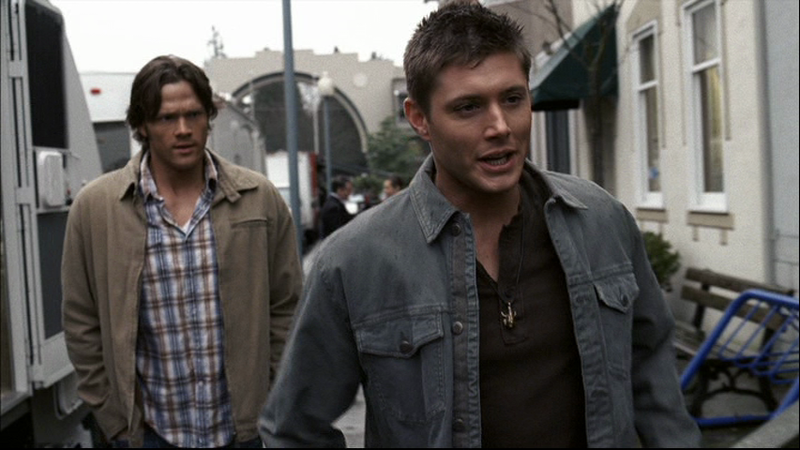 In Hollywood Babylon (2x18), Dean is wearing it at the end of the episode when he exits Tara Benchley’s trailer. In Time Is On My Side (3x15), this might be the Henley that Dean is wearing when they are in the motel room and Dean is trying to eat while Sam tells him about the medicinal use of maggots. In No Rest for the Wicked (3x16), Dean wears it from the beginning of the episode until they get the knife from Ruby. In Are You There God? It’s Me, Dean Winchester (4x02), Dean wears it for the entire episode. In Wishful Thinking (4x08), Dean wears it at the beginning of the episode when he and Sam are at the bar. In The Monster At The End Of This Book (4x18), Dean wears it after he changes out of his suit at the beginning of the episode until after they see Chuck’s publisher. In When The Levee Breaks (4x21), Dean wears it when he leaves to find Sam after Sam escapes. In Heartache (8x03), Dean is wearing a brown Henley when it gets back to the motel room after interviewing the doctor about the guy who gauged out his own eye. i adore this project and am amazed at the work you put into it.